I walked up and down the street that I think I lived on, then down the back alleys to see what would connect to memory. I think I found it, looking at the tiny house from the vantage point of the alley. The yard was strewn with vehicles, but imagining them gone, seeing the house in the distance, and the house it sits beside - Sonja's house back in the day - and everything seemed to click. I regained my balance in that home and in that time after my first wife left. It looks way smaller today that it seemed at the time. Its tiny size size felt perfect for my new beginning. Twenty-five years is a long time. Houses change owners, renovations happen, things change inexorably. The same goes for the rest of town, public facilities, businesses, and local landmarks. There are a few things that look familiar, but not a lot. 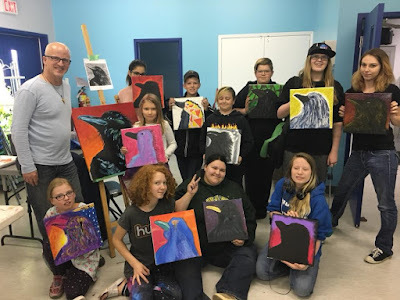 I spent three hours at the Heartland Youth Center yesterday, a marvellous new building since my time volunteering with the organization, leading a raven painting workshop with a range of talented young artists. The community hall, the venue for tomorrow's live painting, is also new since I left the community back in the mid 1990s. A few faces will be familiar, but a community does a lot of churning in a quarter century. I came to Stettler in 1991 as the new program director of Q14, a country music radio station owned by the CHUM Group out of Toronto. They had three Alberta properties at the time. The Q Group also included Drumheller (Q91) and Brooks (Q13). Early in my tenure, I met Ron Truswell and Winnie Bissett at the Heartland Youth Center, and quickly joined their Board of Directors. It was my first volunteer gig as a member of a board. I was 24 or 25 at the time, really just starting to stretch my legs as a grown adult. Winnie shared with me that I had made some suggestions that helped grow their annual radio auction, which eventually morphed into their annual Awesome Auction that I am contributing to tonight. Over the years, it has raised hundreds of thousands of dollars and is their primary fundraising activity.